La Tomatina is the biggest food fight in Spain. La Tomatina is held annually in the month of August. The highlight of the festival is the tomato fight which takes place between 11am to 1 pm on that day. 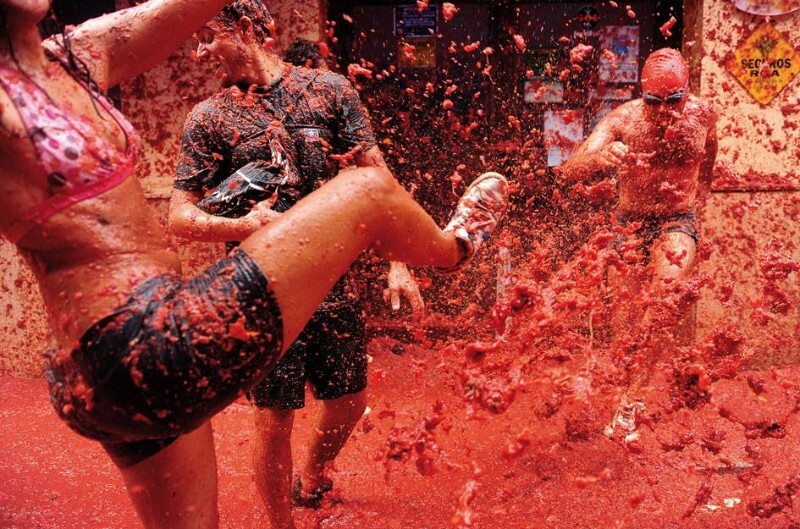 This festival paints the Spanish town of Bunol with an incredible 40 metric tons of tomatoes. The tomato throwing festival is celebrated each year on the last Wednesday of August annually. A week before the last Wednesday in August, the festivity of this Spanish festival begins in full swing. Events like Parades, fireworks, music, dancing and the paella cook-off contest draw visitors to Bunol for the annual fiesta. The festival is in honour of the towns patron saints, Luis Bertran and the Mare de Deu dels Desemparats a (mother of God of the Defences) a title of the Virgin Mary. A slice of ham marks the beginning of the tomato fight. At 10 am on the day of Tomatina. A slice of ham is hung on the top of a greasy pole in the crowded town square called the Paol Jabon. The goal is to climb and retrieve the slice of ham along with the crowd chanting and singing in encouragement, while being showered by water hoses. The moment the slice of ham is dropped from the pole on to the ground a loud signal goes off. Then a truck loaded with tomatoes enters and then begins the chaos. This fight lasts for just an hour. Around 150000 tomatoes meet their fate. The tomatoes used are low quality, inferior in taste and comes cheap from a place called Extremadura. Once the fight ends the fire fighters wash the streets and people down with hoses. Surprisingly enough the village streets look quiet clean with the acidity of the tomato acting as a disinfectant. Many shopkeepers prepare before hand by protecting their stores with sheets of plastic thereby saving themselves a great deal of trouble. If you are taking part in the tomato fight then a pair of goggles might come is necessary to protect your eyes from the hazardous tomato hurling. Participants are requested to squash the Tomatoes before pelting each other so they hurt less. Due to its massive growth in popularity attracting 45000 people at its peak– La Tomatina is now a ticketed event to limit the number of tourist to the town, Only 22000 tickets go on a sale. The town’s five thousands residents get free access but the remaining 17000 attendees have to pay. Accommodations are very limited for people who come to La Tomatina. Many people prefer take the easier option of staying in nearby Valencia just 38km to Bunol by bus or train. Another option is to head for the small family run campsite called La Granjita in Chiva which is only 10 km north east of Bunol. The owner provides you with the tent, bed sheet towels as well as breakfast and an evening meal. There is also a small pool which is so inviting once you get back from the fiesta. There are certain rules and regulation that need to be adhered to during the La Tomatina in order to ensure that the maximum number of people get the maximum enjoyment for the day. It is illegal to bring any kind of bottles or other objects so that no accident is caused. You must not tear T- shirts. Tomatoes must be crushed before throwing to avoid hurting people. You must be careful to avoid the Lorries which carry the tomatoes. As soon as the 2nd banger goes, you must stop throwing tomatoes.